This blog's now on Twitter as Number5TypeCard, another handy way to track site updates. Also on Twitter? If so, I'm also asking a two-fold favor! 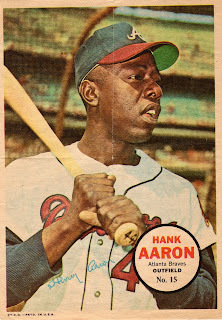 As a bonus for people reading this far, I wrote up the 1967 Topps posters Hank Aaron for "Things Done to Cards" in December. It's one of my favorite Hammerin' Hank "cards."